Way back in 1825, with the revolutionary war 49 years past and the purchase of Florida from Spain only 5 years gone, America still very much feared attack by a foreign power. 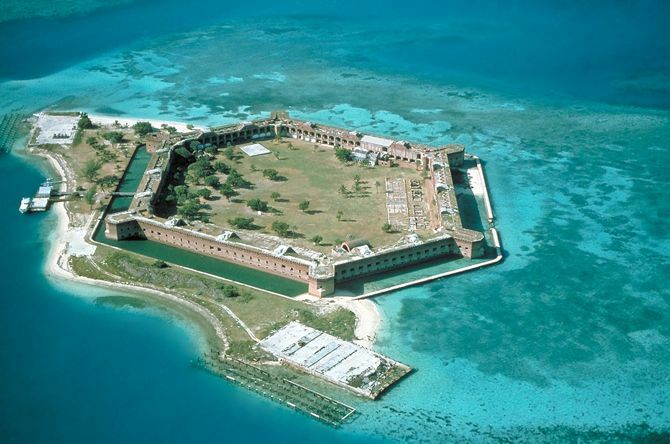 Inspectors were sent to the Dry Tortugas in the mouth of the Gulf of Mexico to source sturdy islands for fortification. 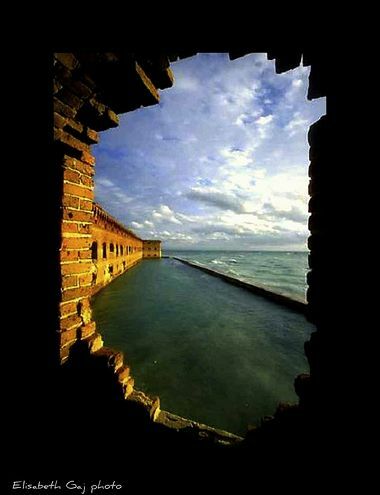 21 years later Fort Jefferson was built on sandy Garden Key, designed to consolidate the young country’s coastal defences and secure her lines of naval trade. 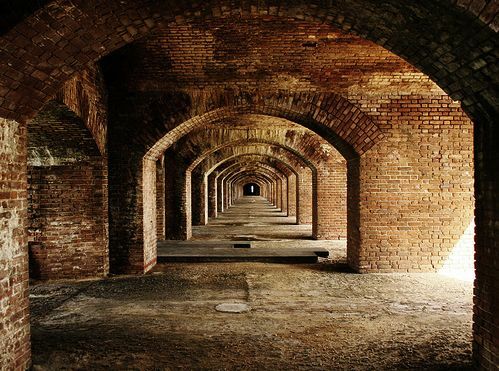 For only 42 it saw active military service, in Federal hands for the Civil War, then serving briefly as a prison for naval deserters, common thieves, as well as the suspected assassins of President Lincoln. 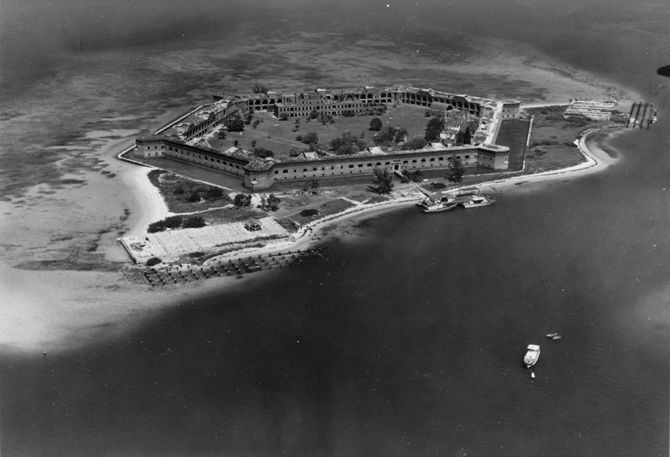 In 1888 the Navy handed it over to the Marine Hospital Service to be operated as a quarantine station. 47 years later in 1935 President Franklin Roosevelt visited and designated the area a National Park. 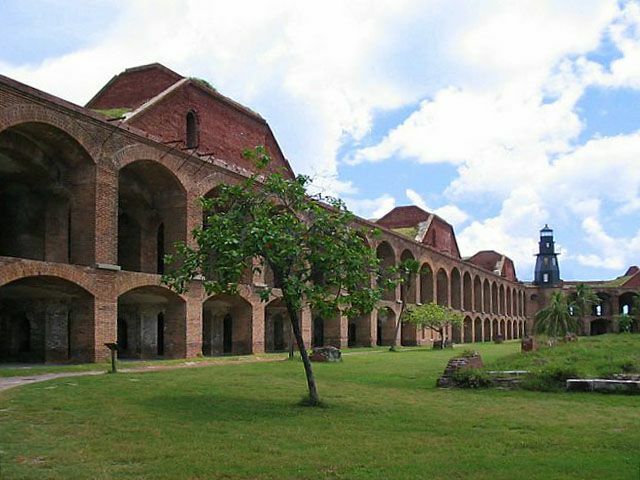 So now it remains, visited by tourists and maintained by Rangers, still the largest masonry structure in the Western hemisphere (with over 16 million bricks), a gorgeous hexagonal structure that both speaks to history and to the mentality of Americans, a people who only recently (compared to others) won their country from colonial powers and have ever since defended it to the hilt. That place looks amazing. I’ve never heard of it before. 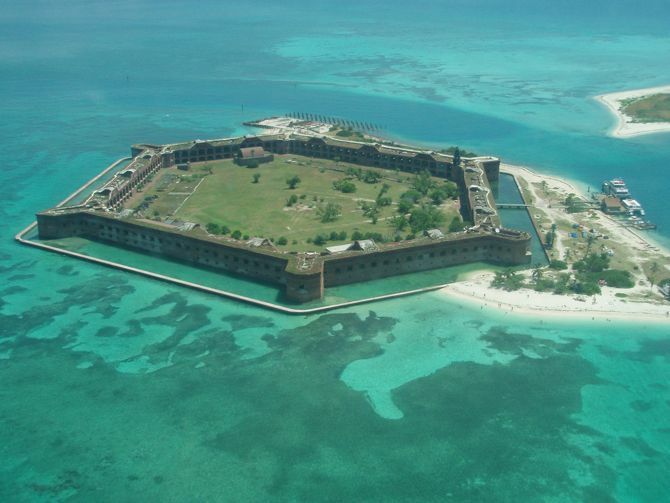 Amazing it is still so intact for so long right there on the ocean in that tropical climate. Tornadoes- You and me both, would love to visit some day. 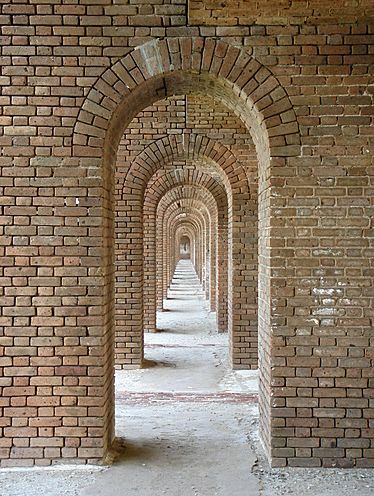 I had the good fortune to spend a whole day at Ft. Jefferson. 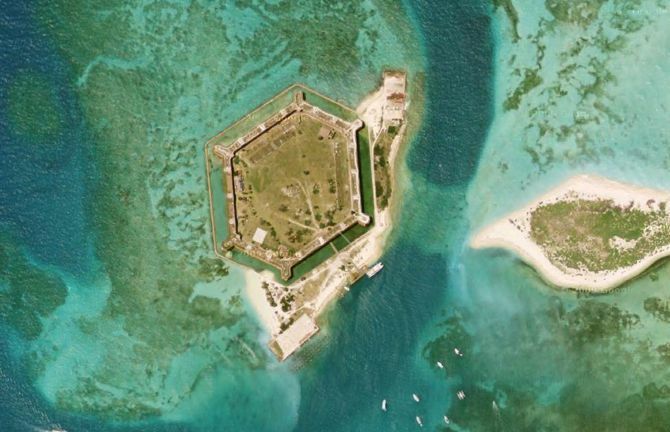 (I am interested in 3rd Generation Costal Fortifications, of which Ft. Jefferson is a part). I flew to the fort by seaplane (20 minutes). There is also a ferry that runs multiple times daily. I can honestly say that the location and structure form the single most vivid impression of my life. The fort is massive. Its architecture rivals that of great structures in Europe. Three park rangers and their families live within the fort year-round. Nice folks! 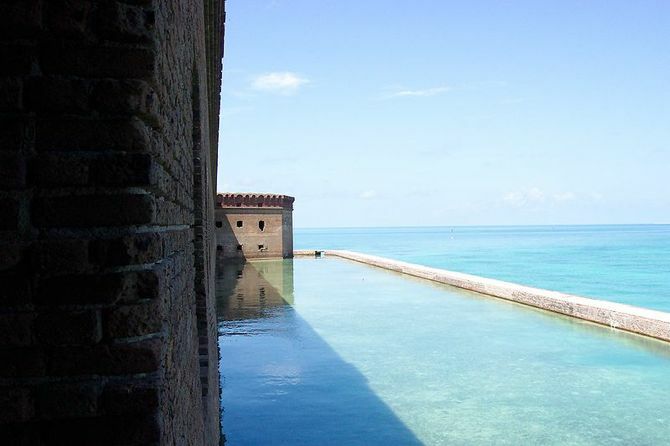 There is a paved walk outside the moat that travels the entire circumference of the fort – almost a mile. The surrounding water is crystal clear and has the marvelous property of changing between a lite blue to green and back. 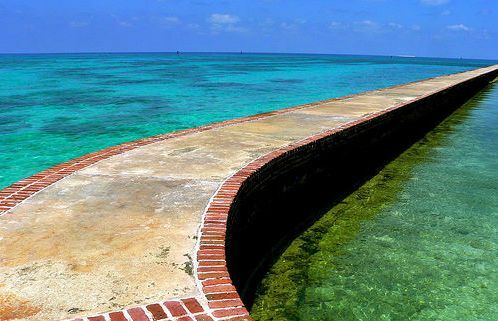 If you like history, architecture, quiet, seclusion, snorkeling, and more, this is a “must stop” place a couple times in your life. 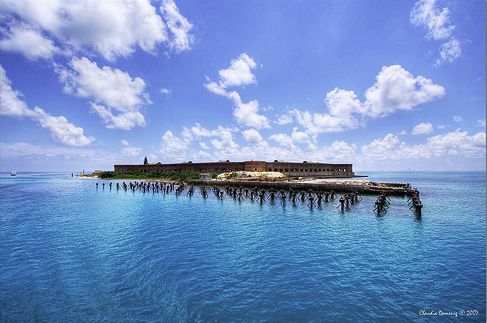 Also, think about the fact that you will be only 70 miles from Cuba. The seabreezes tend to tame any heat and humidity. You can apply to camp there overnight for a couple of days. Sunset and the completely black night sky, filled with more stars than you thought possible, make their impresssion, too. Hey, is this a place where some years ago they shots a 007 movie with Halle Berry ? This place played a cuban clinic for dna transplantation if I good remember.